Just 30-45 minutes drive by car to central Ho Chi Minh City or Phu My Hung Urban area along to East-West Highway (Vo Van Kiet Boulevard) - Highway I or Saigon South Boulevard (Nguyen Van Linh Street) . And the same time to go by waterways along to Bến Lức River, Chợ Đệm River to Bạch Đằng Port ( District 1) and Tân Thuận Port( District 7) . Moreover, just 5 minutes drive by car by railway from depot monorail 3A at Tân Kiên( Bình Chánh District). Mr.Steven Chu Chee Kwang, CEO of Nam Long DVC said: "Waterpoint has a tendency to be a Urban Area which has environment comnbined nature, water & riverfront features with various comprehensive range of facilities and amenities to citizens not only settle down but also studying, working, relaxing as satellite towns in the world". As masterplan, the period 1 will be done in next 5 years. 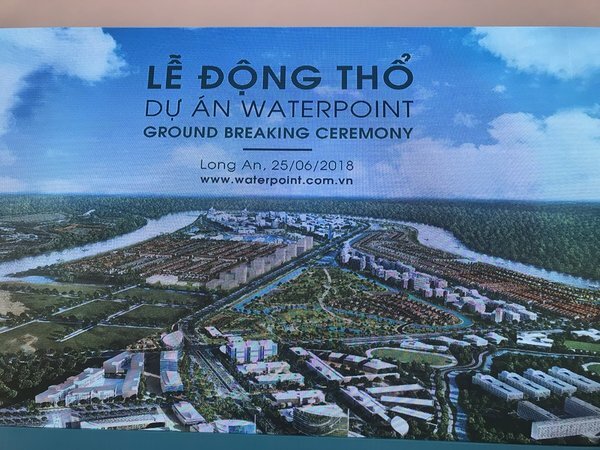 Some partners who will cooperate with Nam Long DVC are masterplanners from Australia, Spain, Germany, Singapore, and Malaysia ,...Capital at this time is approximately 6.900 billion VNĐ and it will make profit about 10.700 billion VNĐ for them. Beside the own capital, Waterpoint project also received the attention of many international real estate developers, especially ones in Japan and Malaysia.